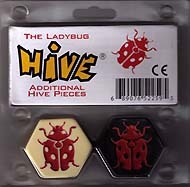 These pieces can be added to a standard Hive set and can be placed in the same way as the other pieces. Once in play, the Ladybug moves three spaces, two on top of the hive then one down. It must move exactly two on top of the hive and then move one down on its last move. It may not move around the outside of the Hive and may not end its movement on top of the hive. Even though it cannot block by landing on top of other pieces like the Beetle, it can move into or out of surrounded spaces. It also has the advantage of being much faster. This little beauty adds a whole new dimension to attack in this splendid game. Inexpensive - yes, and if you have Hive and don\\\'t have this, well, you are missing out on some amazing strategic changes.